This post has been updated from 10 to 13 event planning tools. That means three more event planning productivity tools to make you a more efficient event planner! Do you feel like there’s just not enough time to do everything that needs doing? Are you constantly harassed by deadlines and haunted by your ever growing to-do list? One of the best ways to tackle this is to do things smarter, faster, and more efficiently, so you can achieve the same outcomes in less time. Here is a list of popular productivity tools used by event planners of all shapes and sizes (most of them free), that can help you reclaim some ‘you time’ from your busy schedule. Some events can become beasts, with many moving parts and multiple people or teams working on them. To keep everything in order and help you stay on top of all the different components, why not try using one of these well-loved project management tools? 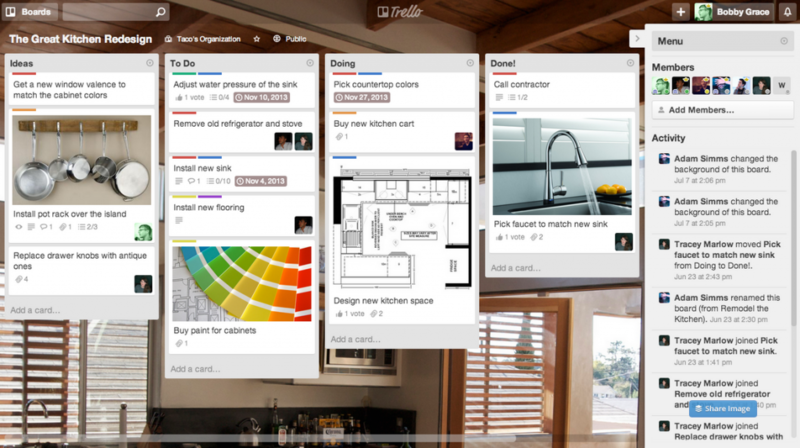 Trello is a great free app which revolves around adding cards to a shared board, so everyone can see what needs doing, what’s progressing and what has been completed. There is a free plan for individuals, and then a per user fee for pro features and teams. 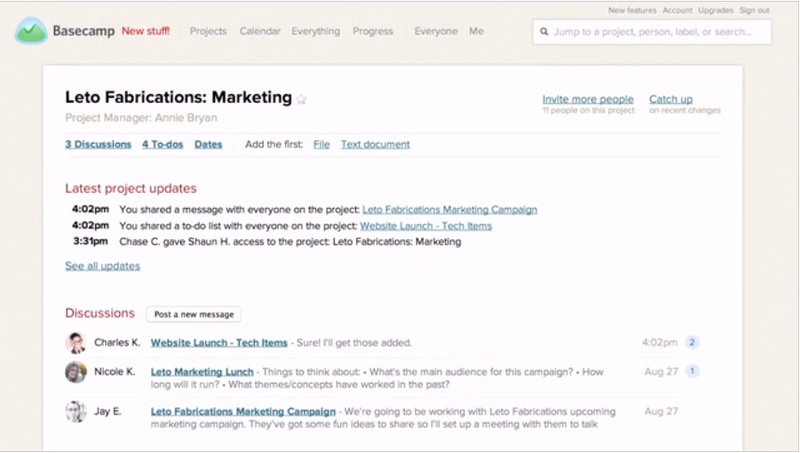 Slightly less visual than Trello, but arguably more fully-featured and aimed at larger projects and enterprise teams, Basecamp is pretty much the grand-daddy of project management software and it’s continued success is a testament to how much people love it. You can sign up for 30-day free trial, then pay a flat fee of $90 per month, with no per-user fees. This isn’t really a project management system, but then not everyone wants to learn new software of workflows. If you just want a simple place to be able to store your excel sheets, word docs, presentations and photos; and share them with whoever you want without having to email large files, this could be the choice for you. Ditch those hours scrolling through team emails and try Slack instead. Organise your team conversations in open channels for a project, a topic, a team, or anything—everyone has a transparent view of all that’s going on. Or, you could create private groups or direct message certain team members. Slack isn’t just for messaging; all your files, images, PDFs, documents, and spreadsheets can be dropped right into Slack and shared with anyone you want, centralise all your assets in one place. You can also search through your archive and find items with ease. Event planners are naturally creative, and so you’ll always be on the lookout for new ideas, inspiration and themes to use in your future events. Rather than scraps of paper that get lost (or put through the wash), why not save everything in one place for easy access anytime, anywhere? 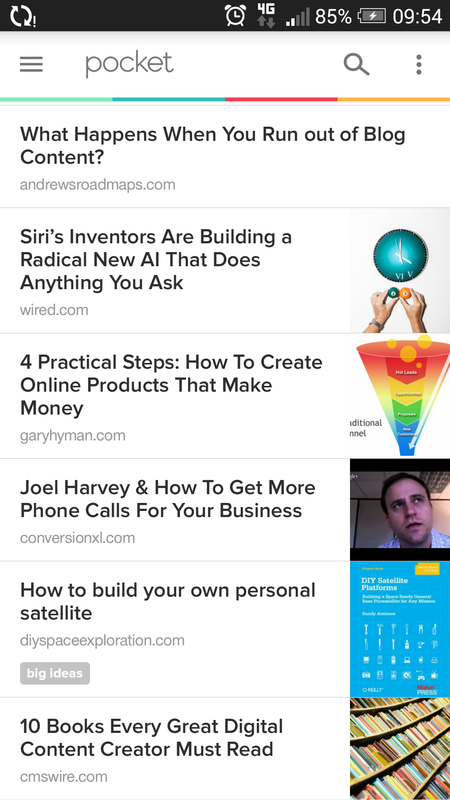 Pocket is the ‘save it to read later’ app. There’s just so much to read online (yes, this blog included) that you’ll probably always have a reading list of articles you mean to catch up on at some point. Well, rather than bookmark them, or worse, forget about them, you can use Pocket to keep them all in one place, conveniently waiting for when you’re ready to read them. It’s also completely free! 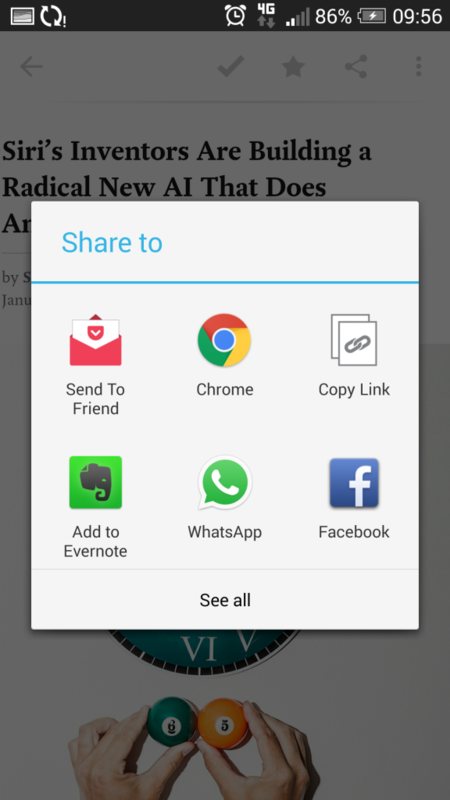 When you have finished reading something from your Pocket, and if you like it, you can keep it for reference in Evernote (they sync directly). However, you can save just about everything in Evernote, from doodles to photos, pdfs to voice recordings. It helps you keep everything organised into notebooks and with tags. Indispensable for anyone who needs to keep track of multiple inputs and ideas each day. It’s also free to use the vast majority of its functionality. Searching for fresh content from one site to another can be highly time-consuming. 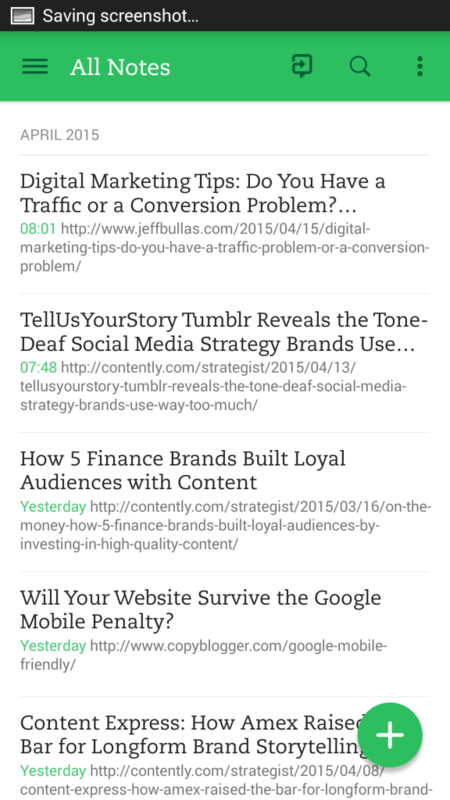 Thankfully, Feedly exists to save you time and help manage third party content. Search by subject or keywords to find relevant content sources, create a sidebar listing the different subject matters, then add the sources to the relevant tabs. Newsfeeds showing the most recent content from each source will then be displayed for you to scroll through all in one place. 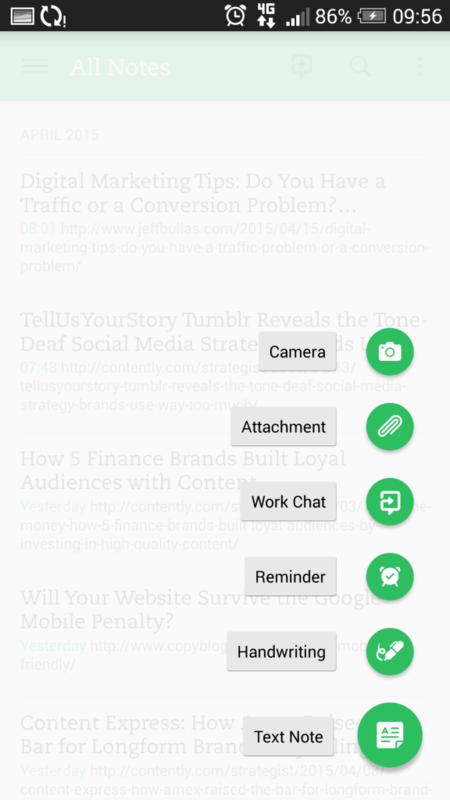 You can also save content to read later, or even share with other team members. Most of the best ideas come from your audience and community, so it’s important to have a simple way of keeping track of what they’re talking about, and then ideally to save them straight to Pocket (or Evernote). 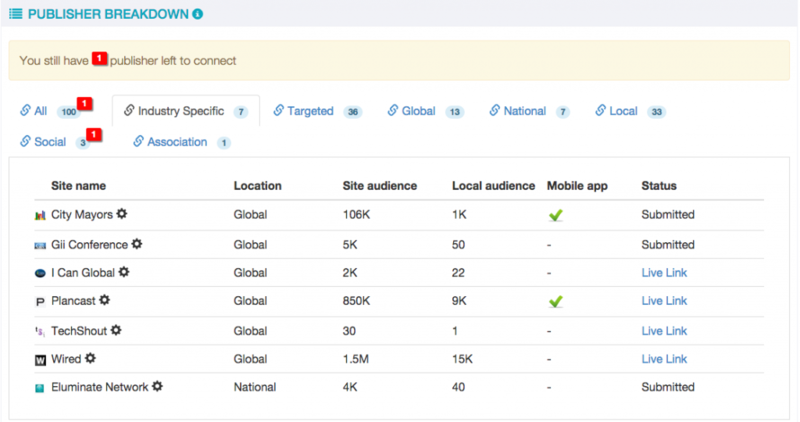 Hootsuite lets you do this, sorting conversations by topic (via hashtags or keywords), by followers or by lists. It also has a fantastic free option. Scrolling through pages and pages of text, searching for inspiration, soon gets very boring. With Pinterest, you’ll be able to find inspiration through beautiful images on all kinds of topics. Create your own boards and pin the images you find inspiring to create your own mood board. When you need some ideas, jump into your board, and hey presto! Inspiration galore! If you find that you’re consistently doing the same task over and over again, consider whether If This Then That (IFTTT) could help you to automate it. For example are you always tweeting posts out from your blog manually? You can set up a recipe for that. Creating a spreadsheet of your new followers? You can set them up to do it automatically. Want to add photos of your event to Facebook? 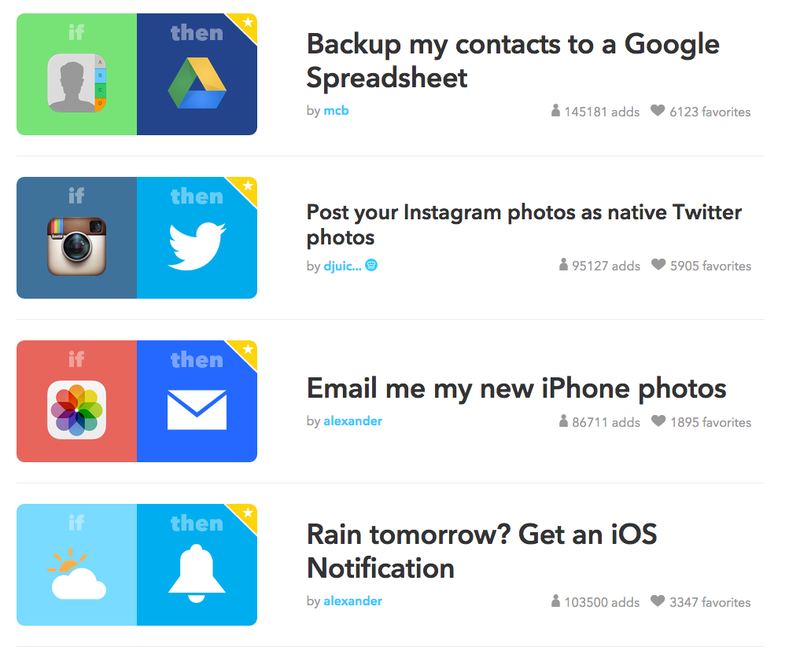 IFTTT will let it happen without you having to think about it again. And like most of these apps, it’s free to sign up and use! Many of the apps on here could be equally useful whatever your day job, but if your day job is planning events, then there are also some pretty great tools out there that can also save you a tonne of time. If you’re stilling using excel sheets (or pen and paper) to manage your attendee lists or trying to manage manual payments etc. then please, stop! 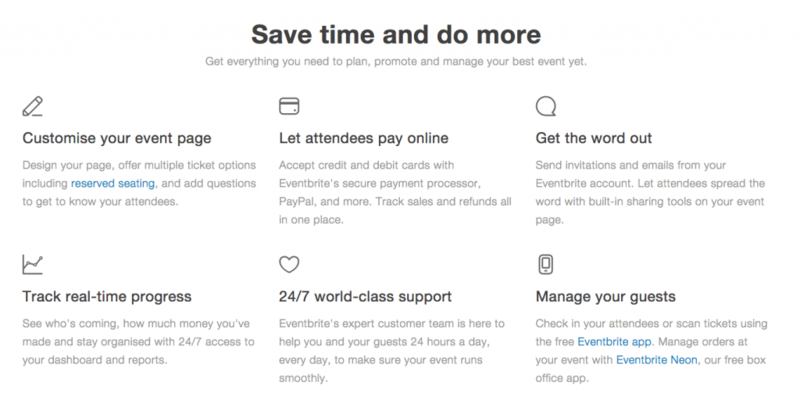 Give yourself an easier life, save hours of time, headaches, lost revenue, long queues, missing or duplicate data and angry attendees…just use Eventbrite to make ticketing, registration and promotion a job so simple that it takes just a few minutes to do. Finding the right suppliers for your event can be a pretty time-consuming and laborious process. 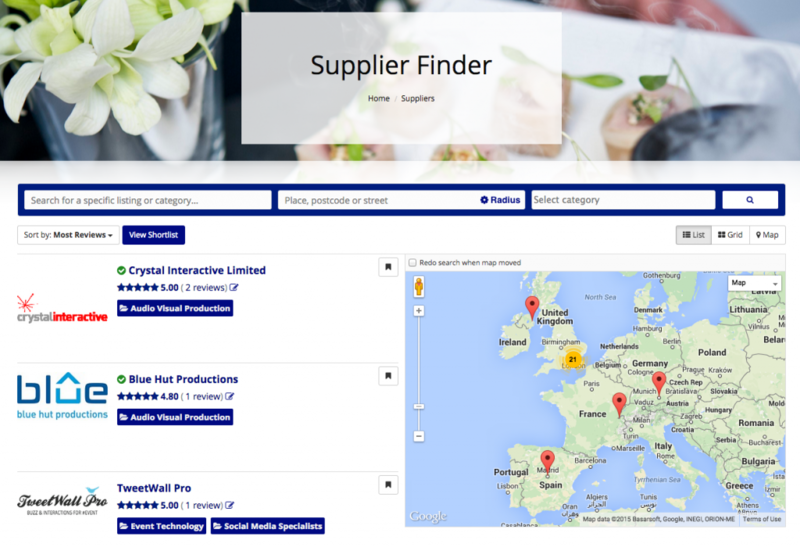 Eventopedia, a UK startup, is working to simplify this process by becoming a ‘Trip advisor’ of sorts for the events industry, by letting organisers rate and review suppliers. If you’ve ever spent the day adding your event to listing sites, then you’ll know how repetitive and time-consuming this task can be. Another UK startup, Evvnt was started to allow organisers to submit their event details to dozens (or even hundreds) of relevant listing sites by submitting their info just once. Even better, you can now pull that information directly from your Eventbite account thanks to our recent integration, making it even faster for you to get your event listed. There’s a free plan, then paid options for those who want to reach even more media. “Don’t work harder, work smarter” is probably the phrase you want to repeat back to yourself next time you feel overwhelmed by your workload. 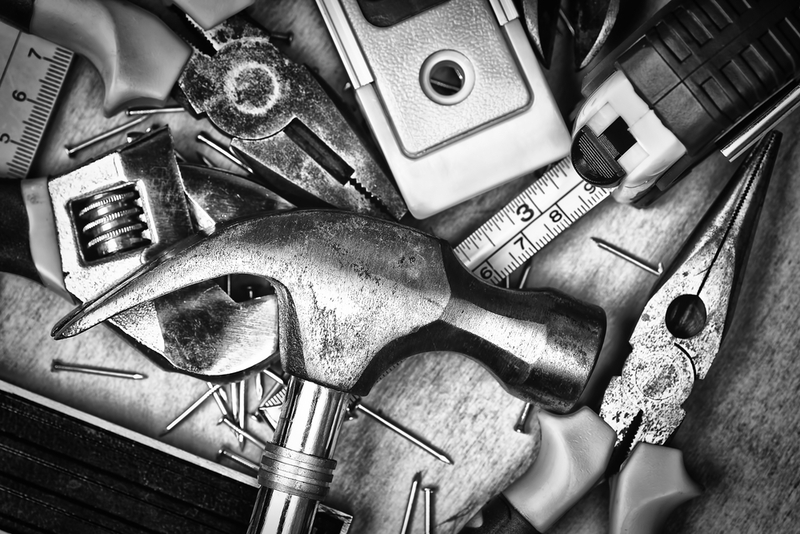 So why not give some of these tools ago and save yourself a tonne of time? 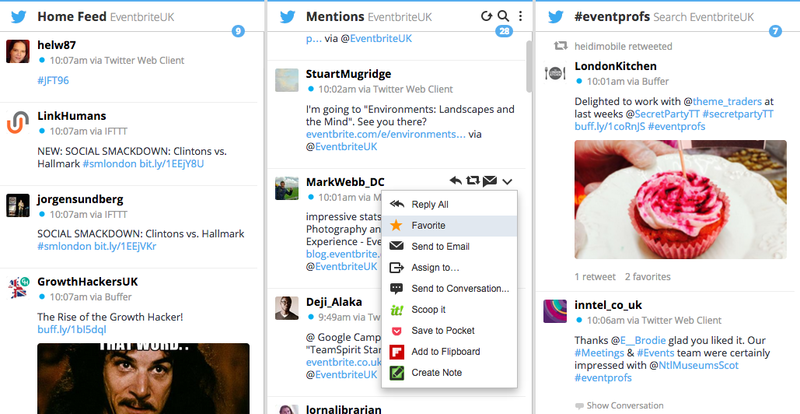 What are you favourite productivity tools for helping you plan events more efficiently? Share them in the comments below or Tweet us @EventbriteUK!